The Explorers Club is a pop band hailing from South Carolina, and MAN do I wish I'd discovered them back in 2008 when this album was first released. The immediate comparisons to The Beach Boys are inevitable, if perhaps unfair in the long run because there's a bit more going on; while the production, instrumentation, and even songwriting owe a large debt of gratitude to Brian Wilson's heartbreaking and beautiful signature style, there are other influences on display here on their debut album, Freedom Wind. Listen closely and you'll hear a young Paul McCartney, and even some folk rock. If you know a bit about The Beach Boys and Brian Wilson, you know that Brian was a huge fan of producer Phil Spector and modeled a fair bit of his style after Spector's signature "wall of sound." With that in mind, it's hard not to listen to The Explorers Club and not hear the sound that Phil Spector created and Brian Wilson adored. None of these influences would mean anything, however, if the songs themselves weren't any good. Lucky for all of us, the songs are tremendous. It's as if someone lifted this band right out of 1966 and relocated them to here in our time. One hears the same jingle-jangle style found in the work of The Byrds and the same catchy pop cohesion that The Monkees rode to the top. Pick a mid-sixties iconic band and you'll probably hear some of that sound here. The 12 songs on this album clock in at a mere 36 minutes are loaded with hooks, lush instrumentation, and the kind of grand choral arrangements and harmonies that made The Beach Boys such an iconic band. 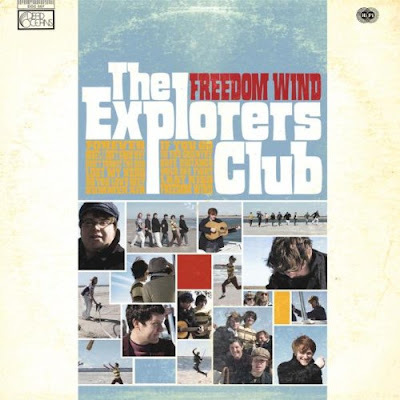 With their many references to the sun and with the blatant love of Brian Wilson on display for all to see, it would be easy to take a cynical stance toward The Explorers Club as nothing but a gimmick band. For me, however, their highly-influenced style comes from a place of love and respect. It's actually remarkably refreshing to hear a young band so committed to the techniques and sounds that were ubiquitous a half-century ago. The attitude seems to be "if it was good enough for the biggest bands of the 1960's, it's good enough for us." I admire this, and I appreciate that they use a classic style now nearly unheard in modern music as a jumping-off point for their own sound, standing on the shoulders of giants to create something that, if not new, is at least special. I'd be remiss not to to mention the packaging for this album. Both the CD and the vinyl LP share the same sleeve design which features a 1960's-style photo montage, complete with fake ring-wear on the cover, simulating the rub that vinyl LP sleeves obtain after years of sitting in the stacks. The packaging is a small detail, but it just adds a further degree of authenticity to this band who clearly love everything about sixties pop. The Explorers Club has luckily survived the years between 2008 and now, though there have been quite a few personnel changes. They released their third full LP in 2016, proving that they aren't just a flash in the pan and that they're serious about this music and their commitment to it. I'm so happy to have discovered them and placed them in the same rotation as their prestigious progenitors. Here's a link to "Forever," one of the album's stand out tracks.